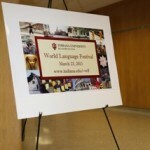 GoAnimate for Schools friend and evanglist Olga Schrivner recently presented “Fun and Motivation through Animation” at the World Language Festival at Indiana University in Bloomington, Indiana. We are thrilled to share this blog post covering her presentation by James Scrivner (NortonHealthcare) and Olga Scrivner (Associate Instructor in French, Indiana University). For Olga’s complete presentation, please click here. 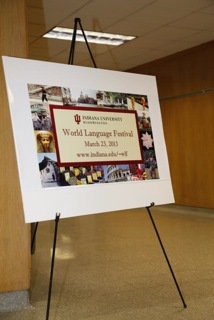 Four weeks ago, the ‘World Language Festival” was held at Indiana University in Bloomington, Indiana. A workshop called “Fun and Motivation through Animation” was intended for language teachers. To demonstrate the importance of animation in the 21th century’s education, the classroom was compared to a living being, taking on traits such as breathing (student awareness) and having a heart-beat (class engagement). First, the audience (high school teachers and IU language teachers) were asked to repeat a few words in French that were written on the chalk board. As the participants monotonously repeated the words, the assistant (James Scrivner) stood up wearing a physician’s lab coat and stethoscope and began checking the heart beat and pulse of one student. He instantly shouted, “No pulse, Non responsive”, “You must do something different.” Immediately the vocabulary words were changed into still pictures and then into a basic animated text. The assistant quickly assessed another student. With the stethoscope he again checked the heart and the pulse and exclaimed, “Pulse getting stronger, you are on the right track.” Finally, the audience was shown an animation in French, created by GoAnimate (Silvia Duckwort). Very quickly the participants were enthusiastically engaged in this lesson. They witnessed how animation turned education into EDUTAINMENT (education + entertainment) (Boswood 1997). In fact, Walt Disney once said: “Animation offers a medium of story-telling and visual entertainment which can bring pleasure and information to people of all ages.” Since we, teachers, live in the 21th century, a very interactive and visual world, we must “understand the importance of graphics, music, and cinema, which are just as powerful and in some ways more deeply intertwined with young people’s culture” (George Lucas). By replacing a still picture (or no image at all) with animation, we not only improve students’ conceptual comprehension, but also lower their anxiety level (Butler-Pascoe et al. 2003). After all, students feel more fun and learning becomes a happy process (Hoogeven 1995). Hoogeveen, M.J. (1995). Towards a New Multimedia Paradigm: is Multimedia Assisted Instruction Really Effective? In: ED-MEDIA 95 Proceedings, June, Graz, Austria. Boswood, T. (1997). New Ways of Using Computers in Language Teaching. New Ways in TESOL Series II Innovative Classroom Techniques.USA: TESOL, Inc.